[Episcopal News Service] Churches around the world will welcome Christians this Lent as they pray the Way of the Cross, following Jesus’ final path to crucifixion through 14 stations. In New York, that path of prayer will stretch the full length of Manhattan. A public art exhibition opened Feb. 14 on Ash Wednesday and will continue through Easter on April 1 that traces the Stations of the Cross from “Jesus Is Condemned” near the northern tip of Manhattan to “Entombment” at the National September 11 Memorial. At each stop, people of all faiths are invited to view works of art chosen to reflect on ways the Passion of Christ speaks to contemporary struggles against injustice. 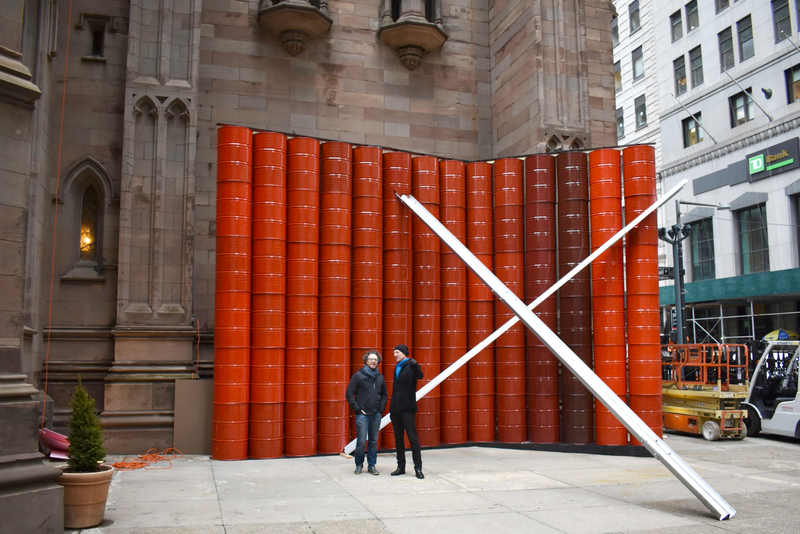 The exhibition, titled simply “Stations of the Cross,” is sponsored by Trinity Church Wall Street and follows similar exhibitions in London in 2016 and Washington, D.C., in 2017. New York City is a great place to host this year’s edition, Trinity leaders said, suggesting that the metropolis is a greater hub of religious activity and reflection than it usually gets credit for. Moody, a retired priest who attends Trinity, was co-curator of “Stations of the Cross” with Aaron Rosen, a professor of religious studies at Rocky Mountain College who helped create and assemble this and the two prior versions of “Stations.” Although the subject matter is drawn from Christianity’s most solemn and foundational story, this “Stations of the Cross” is presented as an explicitly interfaith experience. Could aspects of Jesus’ story also speak to a Muslim or Jew or atheist? “I wanted to explore that sense of friction and tension for myself,” said Rosen, who is Jewish and married to an Episcopal deacon. To represent each station, Rosen selected from existing artworks, some that were hundreds of years old, while others were commissioned specifically for “Stations of the Cross.” In some cases, works created for the London or Washington exhibitions were brought to New York, with slight modifications. Trinity, which Rosen called “sort of the radiating center” of the exhibition, was chose for the 13th station, “Jesus Is Taken Down From the Cross.” Just outside the church, next to its renowned cemetery, stand 14 tall columns of stacked oil barrels. The red columns are intersected by two steel beams that, when viewed from a certain angle, form a large cross. The artwork, titled “Stations,” was created by G. Roland Biermann, who painted the barrels in 14 different shades of red, signifying the color of blood. 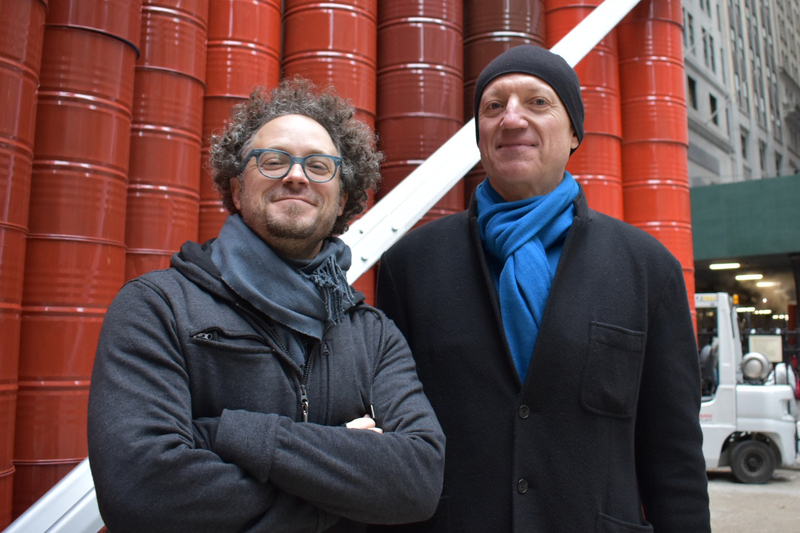 Standing with Rosen and church leaders in front of his artwork this week, Biermann said he also saw oil as a kind of blood of the Earth, and he noted its connections to the Middle East, the birthplace of Christianity. And oil can be a kind of currency, he said, a connotation that resonates even more with the artwork planted in the heart of New York’s financial district. One value of art is to provoke new perspectives on something we think we already know well, said the Rev. Winnie Varghese, Trinity’s director of justice and reconciliation. So, for Christians who are used to praying the Stations of the Cross every Lent, following the path of Jesus through these artworks is an opportunity to re-examine what the gospel story means for their faith and for the world around them. Varghese also sees something magnificent in turning this faith journey outward, as a public experience that brings people outdoors. 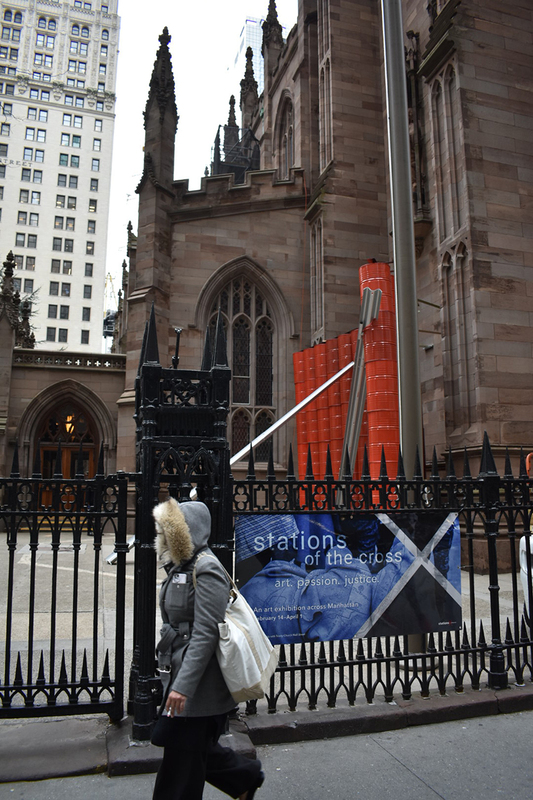 “I love the idea of the city filled with prayer and intention in the way of the stations,” she said, and New York, especially, is suited for such an experience. Rosen and his team found examples of that religious diversity while they were setting up the exhibition. 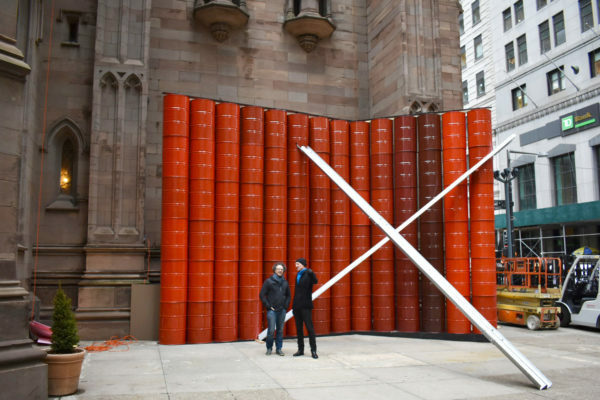 At City College of New York, which is hosting the second station, “Jesus Takes Up the Cross,” the artwork “Hope” by Aithan Shapira features oversized life preservers made of concrete. Immigration is one of the themes of the exhibition, and Rosen saw in this station a connection to the plight of Syrian refugees braving dangerous sea voyages to make it to Greece. The concrete life preservers also were heavy, about 50 pounds each, and a couple of City College students helped move them into place. Both Muslim, they took a break to pray before finishing the work, Rosen said. Another highlight is the Chapel of the Good Shepherd at St. Peter’s Church, which is the eighth station, “Jesus Meets the Women of Jerusalem.” The chapel itself is a work of art, designed by Jewish artist Louise Nevelson in 1977 – another interfaith connection that Rosen hopes will resonate with visitors. “She could be one of the women of Jerusalem,” Rosen said. Trinity’s St. Paul’s Chapel, which was unscathed by the Sept. 11 terrorists attacks, served as a respite center for rescue and recovery workers laboring just a five-minute walk away at ground zero, where the September 11 Memorial now is located. The curators, in choosing the memorial as the final station, were sensitive to the complicated and deeply felt emotions still connected to that site more than 16 years after the terrorist attack on the World Trade Center. Trinity will host an opening program for the exhibition from 6 to 8 p.m. Feb. 15, featuring the curators, some of the artists and representatives from some of the locations chosen for the stations. If you are in Manhattan, you are invited to visit one or all of the 14 stations this Lent, or you can follow a virtual Way of the Cross with a podcast that provides commentary on each stop. To listen to the podcast, download the Alight: Art and the Sacred app for your phone on iTunes or Google Play. What a Wonderful idea! I will be sharing this on facebook, everyone should see this exhibit!